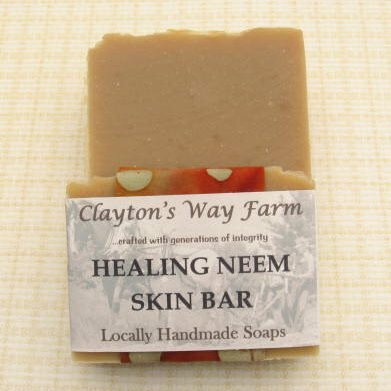 A powerful skin healing bar.. Throughout India and south East Asia, neem (Azadirachta indica) touches the daily life of most people, from the poorest peasants to the wealthier individuals; and after almost 4,500 years of continuous use it is one of India's most respected treatments for problem skin. When used on eczema, psoriasis, acne, and skin problems in general; neem can effectively kill the trouble causing bacteria, and reduce and relieve the inflammation, redness and itching while improving the general condition of the skin. Skin benefiting essential oils of tea-tree and palmarosa, as well as goat milk boost this power packed medicinal soap. Ingredients: Saponified coconut, palm, olive, neem, and castor oils. Goat milk; tea tree and palmarosa essential oils.